CHIPPEWA FALLS...AND MOVING EAST AT 45 MPH. INSIDE A STURDY STRUCTURE AND STAY AWAY FROM WINDOWS. Swamped. Thanks to The Superior Telegram for sharing this photo. Highway Chasm. This is what rapidly-flowing water can do - remarkable. 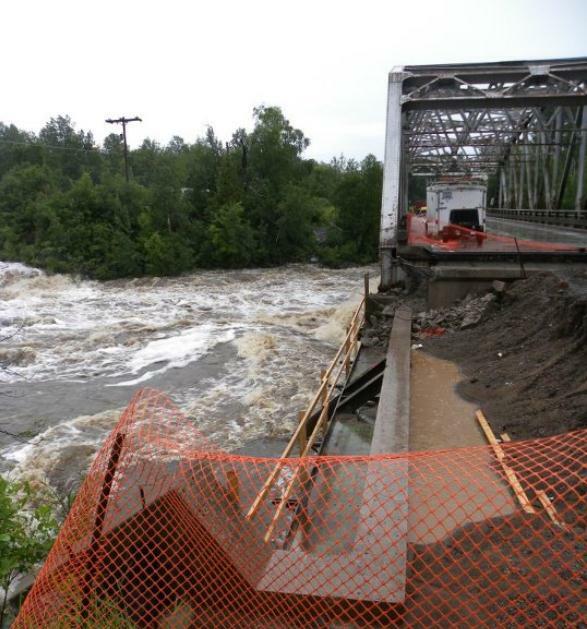 This is on Highway 13, courtesy of The Superior Telegram. 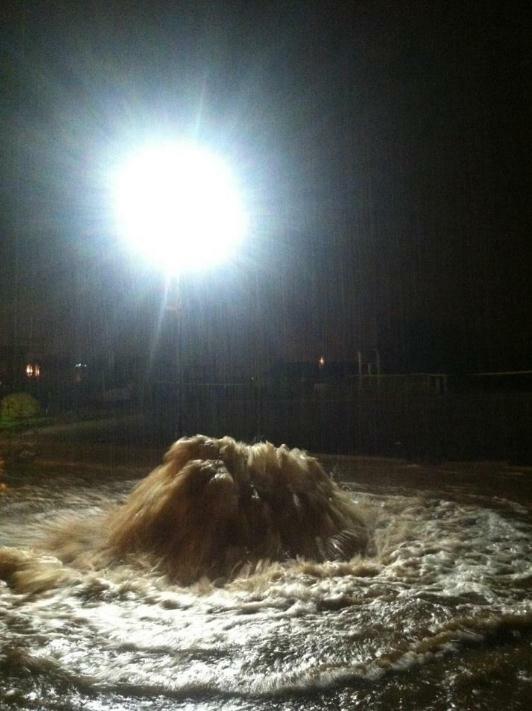 Fountain Of Sewage. Thanks to Ian Luhm at WDIO-TV for sharing this photo. St. Louis River At Thompson Dam. Details from the Homeland Security Emergency Management Office via Facebook. Sinkhole. 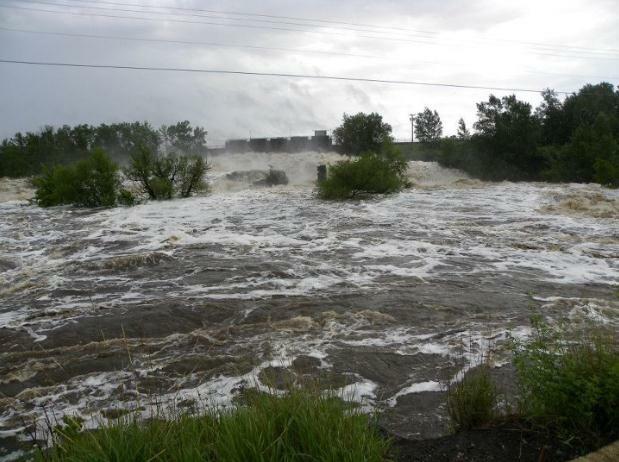 Scenes like this are being replayed across much of northeastern Minnesota, the result of record rainfall amounts in many communites. Photo courtesy of Homeland Security Emergency Management. Munger Trail At Stewart Creek. Photo courtesy of Fox 21 in Duluth. "I'm declaring a State of Emergency in the City of Duluth. Please stay off the roads - there is significant damage, debris and popped manholes. Crews are out in full force, keeping traffic off the roads will assist their efforts. If you live in a low area near the river, please seek higher ground. We have a coordinated response with city, county, State Patrol, Coast Guard, Red Cross, and the Feds ready to help. I've been very impressed with the coordinated effort to this point. Thank you to the leaders from across the state offering their help and support. There is another band of rain on our way, so it is likely to get worse before it gets better. I'll post more updates as I get them." Sloppy Front. The arrival of cooler, Canadian air is setting off smears of heavy showers and T-storms. Skies are already clearing over far western Minnesota; by tomorrow we will all be breathing easier. 5:30 pm visible satellite loop courtesy of WeatherTap. 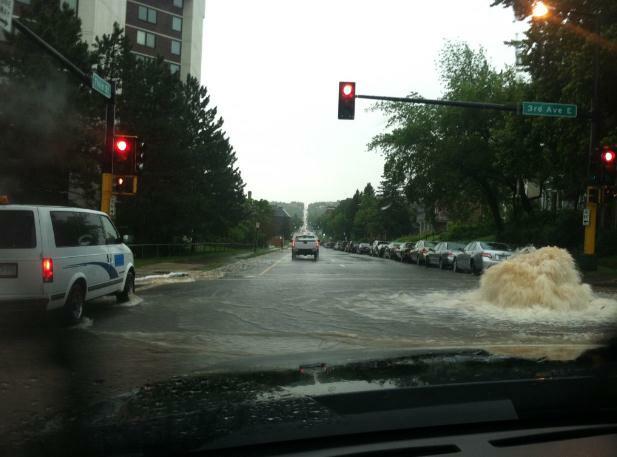 Duluth Central Hillside Flash Flooding. 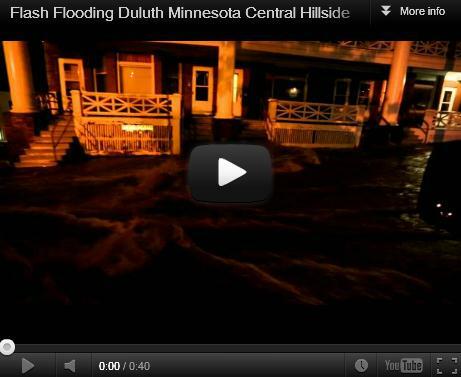 Here's a YouTube clip showing the extent of flooding: "Flash Flooding Duluth Minnesota Central Hillside. Location: East 3RD ST & North 7TH AVE."
Many roads are closed and/or washed out. Driving is not recommended. * source: Cloquet Police Department. Epic Flooding. 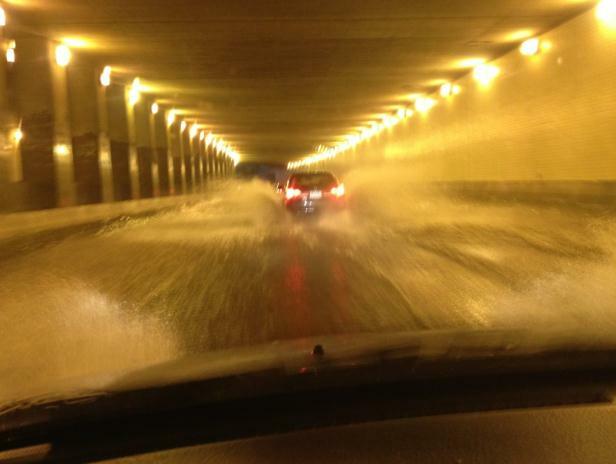 Over 8" of rain in Duluth in less than 24 hours? 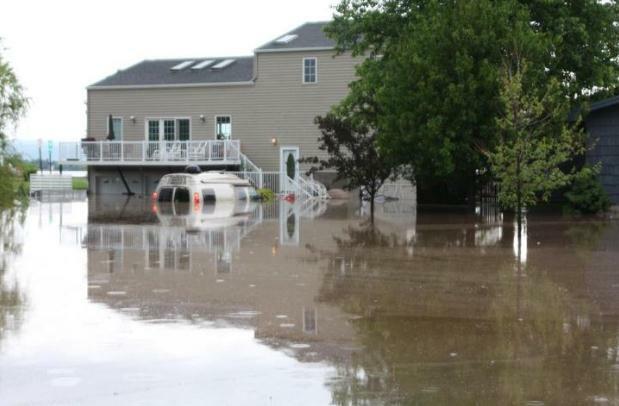 Historic flooding continues to grip the Northland, with severe flash flooding reported from the Brainerd Lakes area to The North Shore. 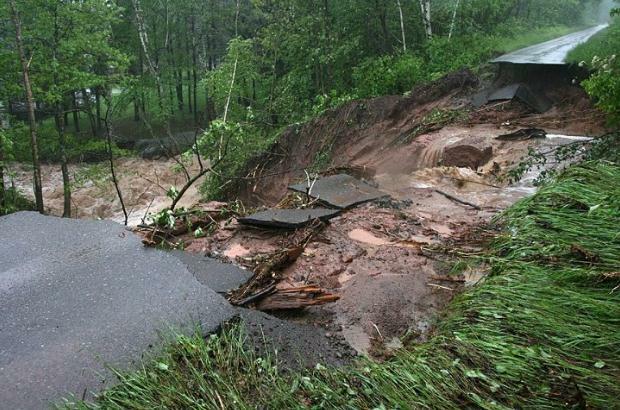 Roads are closed (in some cases washed out); no travel recommended for the northern third of Minnesota. Thanks to Julie Pearce for passing along these pics from the Duluth area. Flooding Snapshots. Thanks to "twdchura" for sending in these photos from the Duluth area. Mayor Ness has declared a State of Emergency. Close To A Record. 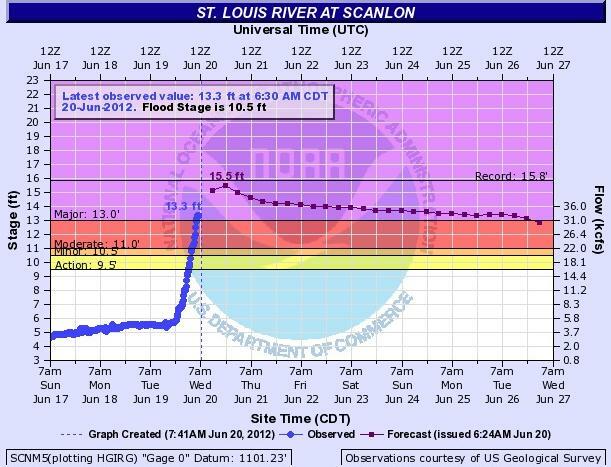 The St. Louis River at Scanlon is forecast to peak very close to the all-time record. Data courtesy of NOAA. 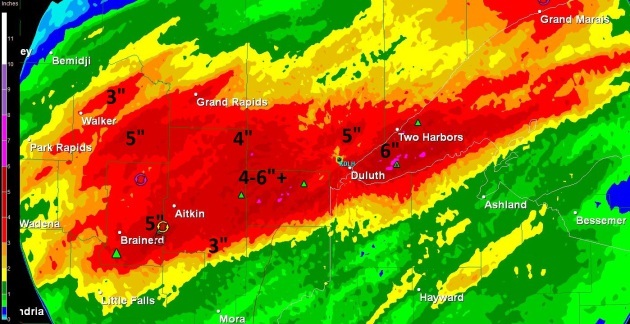 Worst Flash Flooding Since 1972 For Duluth? A train echo effect has resulted in extreme rainfall amounts up north; anywhere from 4-8+" so far from near Brainerd and Aitkin to Duluth; another 1-2" rain may fall today. 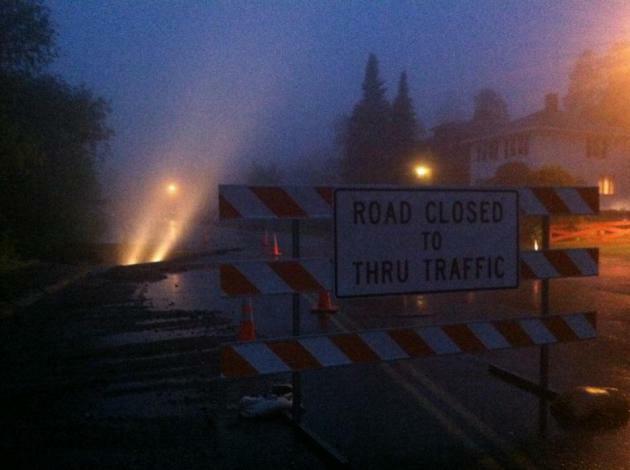 * 8.38" rain reported in downtown Duluth; a summer's worth of rain falling overnight. 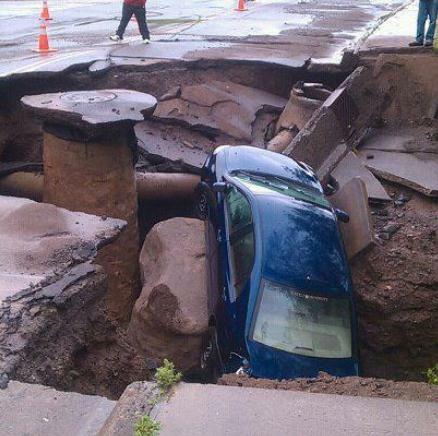 * Sinkholes have opened up all across the Northland. * Portions of Highway 61 and I-35 have been closed due to flooding. 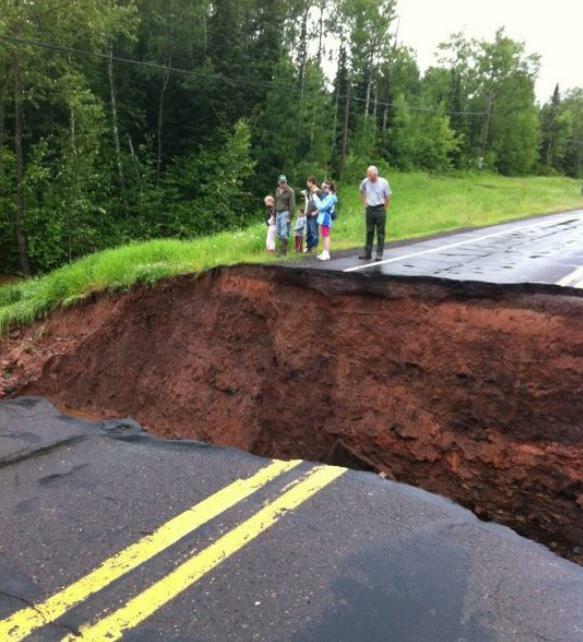 * No travel recommended from near Duluth to the Brainerd Lakes area - many roads and bridges reportedly washed out. * So much water that some of the animals escaped from the Duluth Zoo; many have died. Here's more from The Duluth News Tribune. 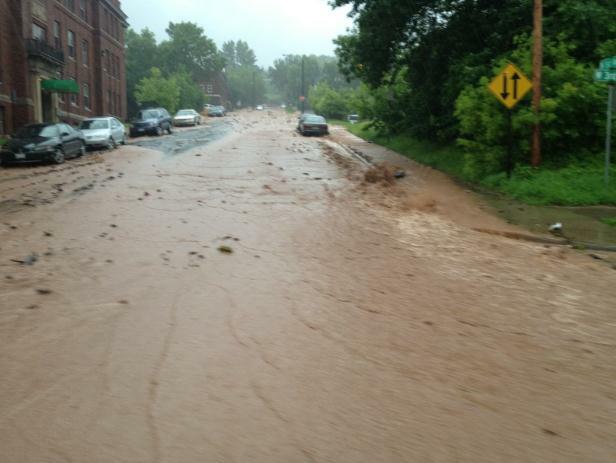 * Worst flooding since 1972, according to some Duluth locals. 79 F. "low" this morning in the Twin Cities. 93 F. high in the Twin Cities Tuesday (7th day above 90 so far this year). 80 F. average high for June 19. 79 F. high temperature on June 19, 2011. 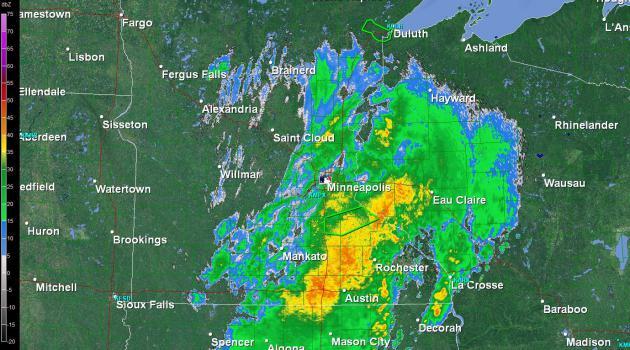 .61" rain yesterday at KMSP. 3.43" rain so far in June (.79" more than average, to date). 6:09 pm official arrival of summer, the Summer Solstice. The sun will be as high in the sky today as it ever gets. 15 hours, 37 minutes of daylight today. 8 hours, 46 minutes of daylight on December 21. Weekend Daydreaming. It's only Wednesday, but most of us are already planning and scheming about what we hope to pull off on Saturday and Sunday. There is no silver bullet (trust me on that one), but lately the ECMWF model has been doing a better job than the GFS. The European model is hinting at a few T-showers Friday night into Saturday; Sunday the sunnier, drier (nicer) day for outdoor plans. 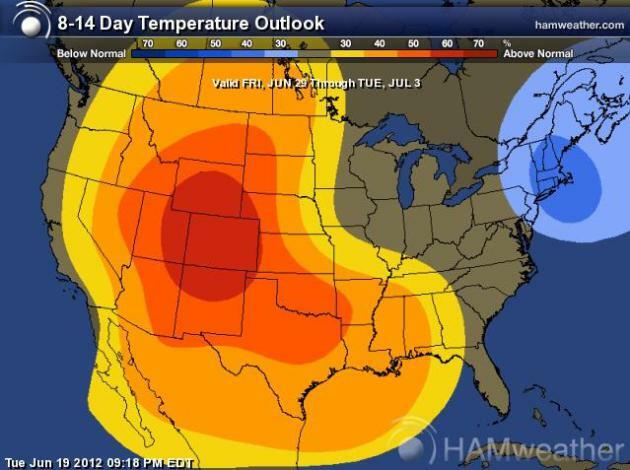 No more nasty heat, no more 90s, in sight through the end of next week. Welcome Summer Solstice! 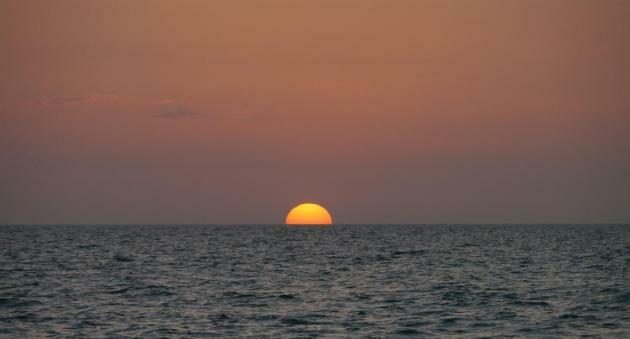 Today is the longest (daylight) of the entire year; the sun's direct rays falling on the Tropic of Cancer at 6:09 pm central daylight time. 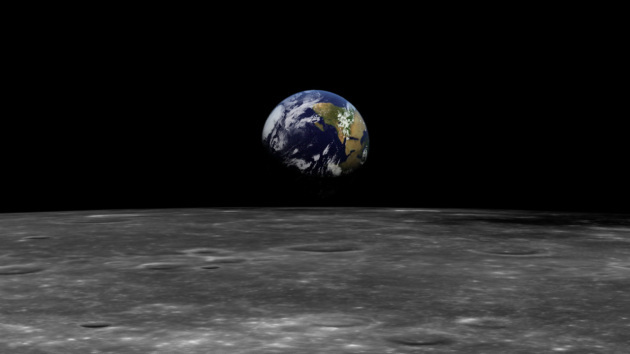 Graphic courtesy of NASA. 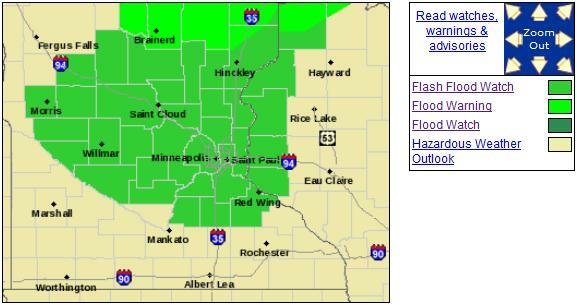 FLOOD WATCH NATIONAL WEATHER SERVICE TWIN CITIES/CHANHASSEN MN 733 PM CDT TUE JUN 19 2012 ...HEAVY RAINFALL POSSIBLE TONIGHT AND WEDNESDAY... .A FLASH FLOOD WATCH REMAINS IN EFFECT FOR MUCH OF CENTRAL AND SOUTHERN MINNESOTA...ALONG WITH A SMALL PART OF WEST CENTRAL WISCONSIN THROUGH WEDNESDAY. SOME LOCATIONS IN THE WATCH AREA INCLUDE LITTLE FALLS...MORA...ST. 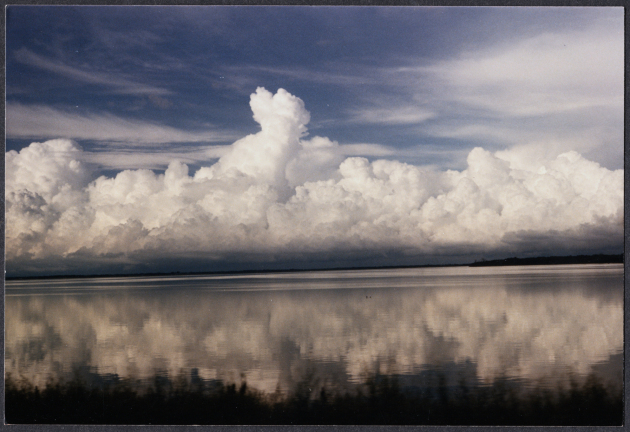 CLOUD...WILLMAR... HUTCHINSON...THE TWIN CITIES METROPOLITAN AREA...OWATONNA...RED WING...RIVER FALLS...NEW RICHMOND AND BALSAM LAKE. SEVERAL ROUNDS OF THUNDERSTORMS WILL OCCUR TONIGHT AND WEDNESDAY AS A WARM FRONT LIFTS NORTH THROUGH CENTRAL MINNESOTA... FOLLOWED BY A COLD FRONT LATER TONIGHT AND WEDNESDAY. TORRENTIAL RAINFALL MAY OCCUR IN THE THUNDERSTORMS...WITH RAINFALL RATES OF 2 INCHES PER HOUR LIKELY. THE GROUND IS NEARLY SATURATED ACROSS PORTIONS OF CENTRAL MINNESOTA...FROM PREVIOUS RAINFALL OVER THE LAST COUPLE OF WEEKS. REPEATED ROUNDS OF HEAVY RAIN WILL LEAD TO RAPID RUNOFF ALONG WITH FLASH FLOODING. ADDITIONAL RAINFALL OF 1 TO 3 INCHES...WITH LOCAL AMOUNTS AROUND 4 INCHES...ARE POSSIBLE BY LATE WEDNESDAY IN AREAS WHERE REPEATED ROUNDS OF THUNDERSTORMS TRAIN. Predicted Rainfall. 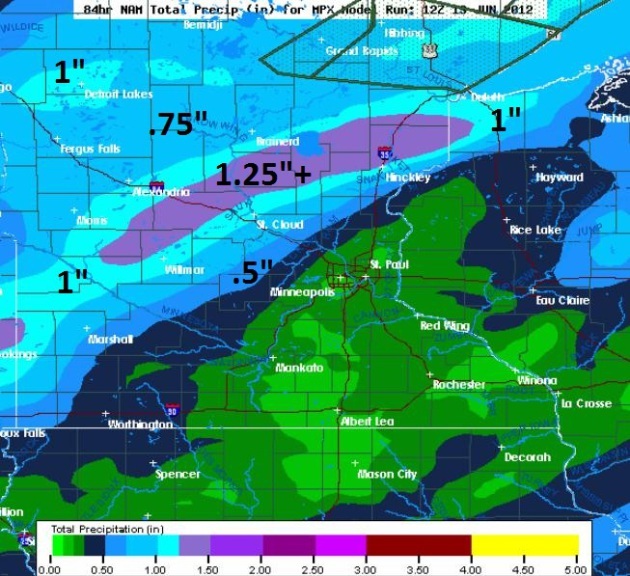 The latest 84-hour NAM model prints out the heaviest rainfall amounts over central Minnesota, over 1" forecast from near Benson and Alexandria to Lake Mille Lacs. Canadian Intrusions. Two cooler fronts are on the way to rescue us from the steamy, muggy conditions we enjoyed/endured yesterday. Front #1 arrives today with more showers and T-storms, some heavy. We cool off and dry out much of Thursday and Friday before Front #2 sparks a few T-showers Friday night into Saturday. A weak ridge of high pressure pushes into Minnesota Sunday, winds swing around to the northeast, and we dry out once again (in theory). GFS model above courtesy of NOAA. 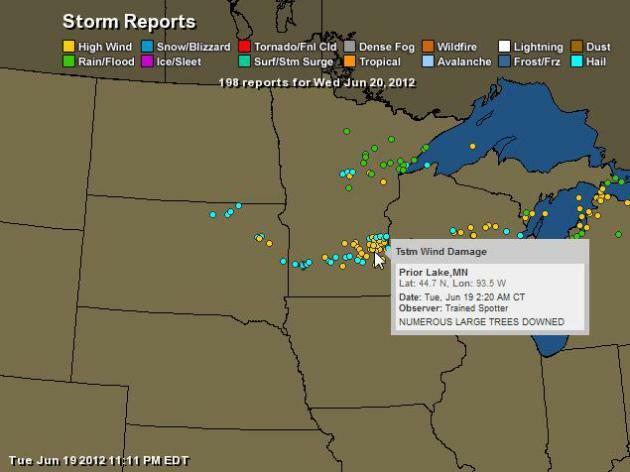 24 Hour Storm Reports. It's easy to see the track of the severe "supercell" thunderstorm that sparked winds as high as 83 mph at Belle Plain early Tuesday. For an interactive map showing the last 24 hour's worth of storm damage click here. Data from NOAA; map from Ham Weather. Today's Severe Storm Potential. 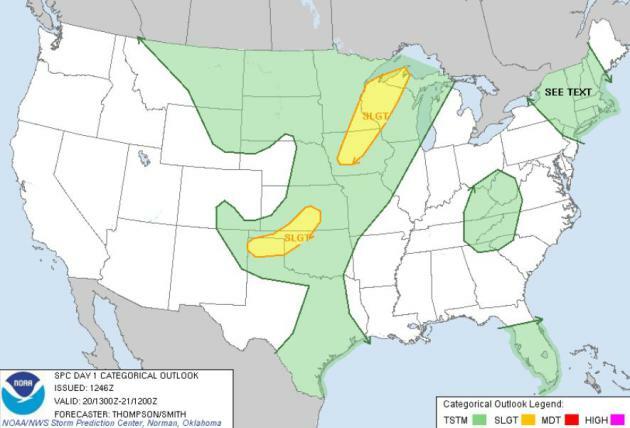 SPC has a risk of severe storms later today from the U.P. of Michigan through the Twin Citiies, Rochester, Eau Claire, on south ot Des Moines. Fewest May tornadoes, nationwide, in 60 years. Perpetual Daylight. Summer officially beings at 6:09 CDT Wednesday. 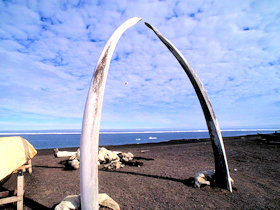 In Barrow, Alaska the last sunrise was on May 11, with sunset on July 31, 82 days later. Thanks to Rich Thomas, chief meteorologist at WSFA in Montgomery, Alabama for passing that nugget along. Photo credit here. "As a matter of conscience and common sense, we should be compelled to fight today's insidious conspiracy of silence on climate change - a silence that empowers misinformation and mythology to grow where science and truth should prevail. It is a conspiracy that has not just stalled, but demonized any constructive effort to put America in a position to lead the world on this issue..." - excerpt of a Tuesday speech given by Senator John Kerry at the Rio+2- United Nations Conference on Sustainable Development; details below. Muggy Today - Breathing Easier By Thursday. All the models show a significant drop in dew point values (50s by Thursday and Friday). A nearly 20 degree drop in dew point implies almost HALF as much water in the air within 36 hours. Hot Front. CPC's 8-14 Day Trend shows significantly hotter than average weather for roughly the western half of the USA, a slight warm bias for Minnesota and Iowa. Map courtesy of Ham Weather. 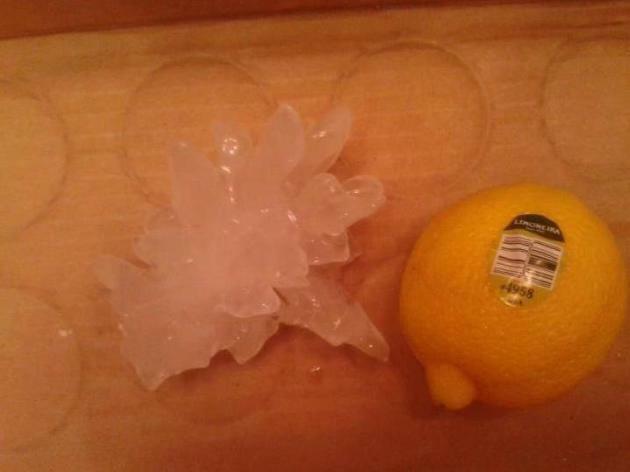 Lemon-Size Hail. I can't remember the last time I saw hail that looked like this. Thanks to Megan and Kevin Komorouski from Lonsdale, Minnesota - spiky hail fell during the wee hours of Tuesday morning (1:30 am). It's getting to the point where we're all going to need helmets just to go out and get the mail. Most 90-Degree Days (11) For Chicago Since 1977. Tom Skilling's crew at WGN-TV does a terrific job, on the air and online. 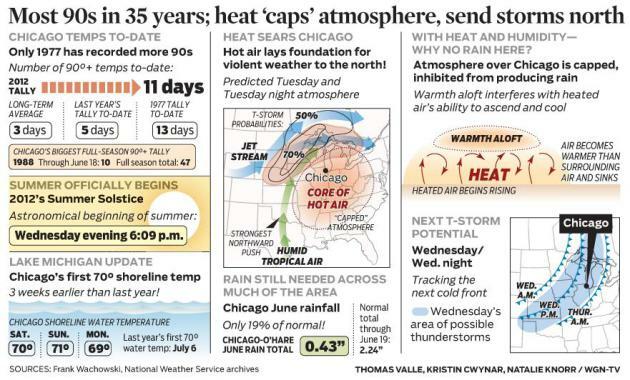 Here's a terrific infographic that explains why The Windy City has been so hot this summer season. Graphic courtesy of chicagoweathercenter.com. 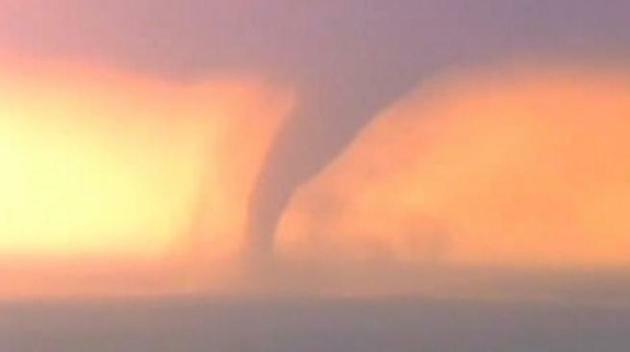 Across The Country , May Was The Quietest Month For Tornadoes In 60 Years. Tornado season peaking in March and April? Earlier tornado outbreaks seem to be a trend, as climate change shortens our winters and accelerates our springs. Here's an excerpt of an interesting story from The Wichita Eagle at kansas.com: "Although it’s been an active tornado season in Kansas, the rest of Tornado Alley has been remarkably quiet. In fact, preliminary numbers indicate the tornado tally nationwide in May was the lowest in 60 years. The tentative national total for tornadoes in May is 110, well below the 10-year average of 300. For just the 15th time since records began being kept in 1875, there were no deaths caused by tornadoes in May anywhere in the U.S."
125 Years Ago Grand Forks Was Blown Away. North Dakota's Dickinson Press has the details; here's an excerpt: "A hundred twenty-five years ago today, a tornado ripped through the heart of Grand Forks and East Grand Forks. It killed eight, injured 100 and caused an estimated $60,000 in property damage, or about $1.6 million in today’s dollars. Yet it has been largely lost to the collective memory of area residents. No plaques remember its victims. No history books attested to its destructive power." Mount Your Best Defense Against Tornadoes. Some helpful advice and good tornado information from Fox Business; here's an excerpt: "If your home doesn't have a basement, get to the most interior, windowless room on the first floor. The goal is to get low and put as many walls between you and the outside. A closet or bathroom works best. Carbin says steel piping helps to reinforce bathhroom walls, and there's also been evidence that getting in a bathtub can be protective. If there's time, put on a bike or sports helmet. Head trauma has been the main cause of death in the most recent outbreaks or tornadoes, says Forbes. Shield your body and head with blankets, pillows or even a mattress. Put pets in carriers." Florida Gully-Gushers. South Florida is getting soaked (again) from a tropical disturbance centered over Cuba; some areas from the Florida Keys north to Naples and Ft. Myers - east to Miami and Boca Raton could wind up with 3-6" of additional rain in the next 48 hours. 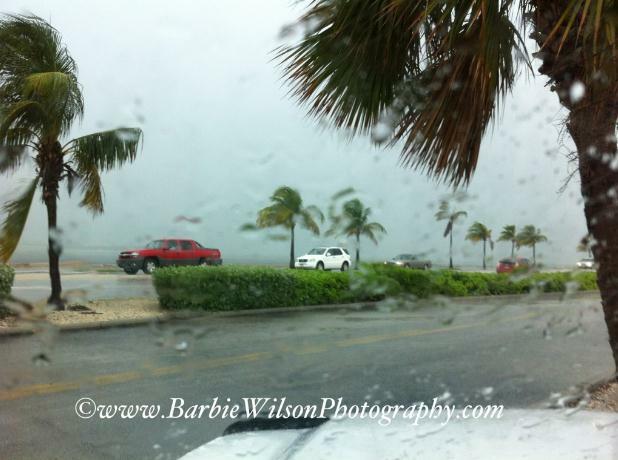 Thanks to Twitter and Barbie Wilson Photography for passing this pic along. 1 in 10 Chance of Tropical Storm Chris? 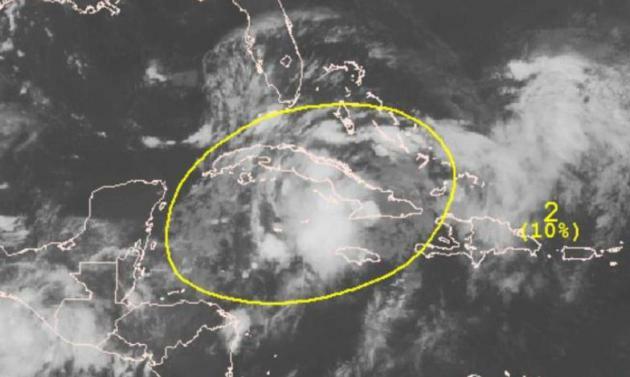 NHC is not impressed with a tropical disturbance hovering over Cuba; they are predicting only a 10% probability of this area of disturbed, thundery weather growing into a tropical cyclone over the next 48 hours. More from the Key West office of The National Weather Service: "The encircled trough of low pressure will be responsible for heavy rainfall at times for the Florida Keys today through at least 800 am Thursday morning. Upper level winds are not expected to be particularly conducive for formation of a tropical cyclone over the next 48 hours. Conditions may become more favorable for tropical cyclone development when this trough of low pressure progresses westward into the Gulf of Mexico later this week." Storm Intensity Forecasts Lag; Communities More At Risk. Hurricane forecasters do an admirable job predicting the track of hurricanes, but forecasting intensity of a landfalling hurricane is much more challenging. Here's an excerpt of a fascinating article from meteorologist Andrew Freedman at Climate Central: "The 2011 North Atlantic hurricane season cost the U.S. billions in damage, largely from inland flooding. 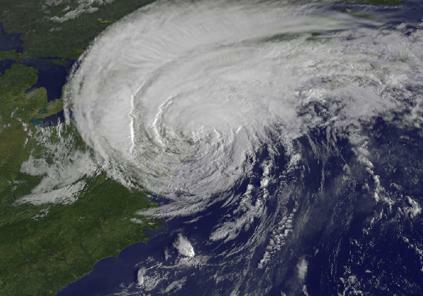 Hurricane Irene alone killed 45 people and cost upwards of $7.3 billion, according to the National Oceanic and Atmospheric Administration (NOAA). But while Irene’s storm’s track was forecast with near pinpoint accuracy days in advance, in keeping with the general state of the science, the intensity forecasts were not nearly as accurate. 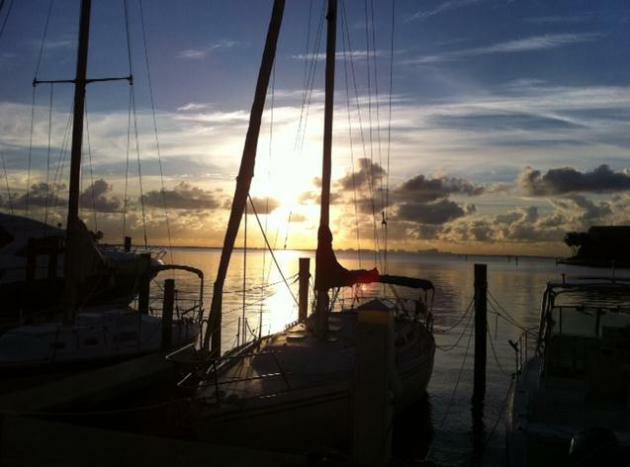 With the 2012 Atlantic hurricane season now underway, forecasters are determined to make more accurate forecasts. As part of a NOAA project known as the Hurricane Forecast Improvement Program, or “HFIP,” they are armed with upgraded tools to help them more accurately predict the path and intensity of these massive storms." Photo credit above: NASA/NOAA GOES Project. Weather Drones To Aid Research Into Forecasting Hurricanes. Military technology is "trickling down" into the civilian sector, in this case providing additional data that may help forecasters with hurricane intensity. The story from The Orlando Sentinel and The St. Augustine Record; here's a snippet: "They don’t look much like boats, or robots for that matter. 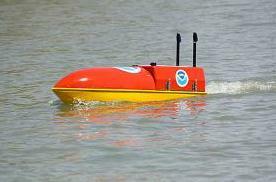 Yet a small fleet of crewless watercraft are to be sent right into the paths of tropical storms for the first time this year with an important mission: Collect valuable ocean and atmospheric data that should improve hurricane forecasts. “We want to obtain swift and continuous data from the eye of the storm for several days, which is very difficult to get in real time,” said Justyna Nicinska, a program manager with the National Oceanic and Atmospheric Administration." No Hurricanes In A Few Years, But Insurance Rates Remain Center Of Storm. The Naples Daily News web site at naplesnews.com has an interesting story about insurance premiums rising and companies dropping coverage for some "high risk" customers, in spite of a lack of a direct, landfalling hurricane in Florida in 7 years. Hurricane Prep For Your Pets. You hope you never need this information, but just in case, TCPalm.com has some helpful advice on how to prepare the most vulnerable members of your family for a hurricane; here's an excerpt: "Some of those preparations are easy to remember; make sure you have enough of your pet’s medications on hand and stock up on food and water, for example. But other preparations must also be considered, such as keeping your latest inoculation and pet license information on hand and having crates available for transportation. Most importantly, microchip your cats and dogs now for easy identification, should you become separated from them during a storm. It’s not enough to rely on tags attached to collars, as these can easily come off in an emergency." 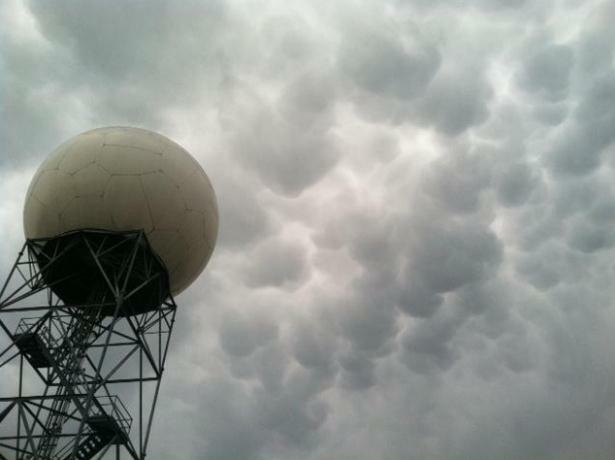 GPS Technology Improves Weather Forecasting. ScienceDaily.com has a story about the benefits of incorporating GPS technology into weather prediction: "The satellite-based Global Positioning System (GPS) technology that guides modern in-car navigation systems is now being used to improve weather forecasts. 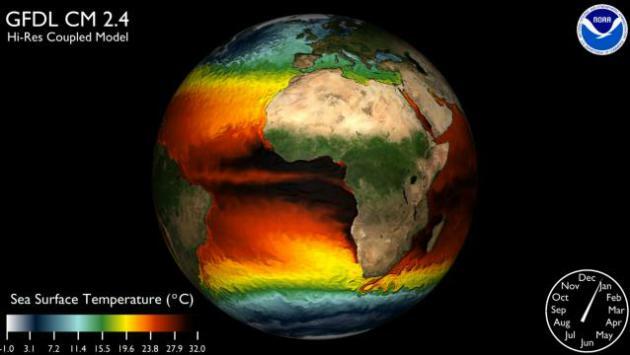 Researchers at RMIT University's SPACE Research Centre and the Bureau of Meteorology are using GPS and low earth orbit satellites to provide an additional type of temperature profile observation for use in weather forecasting computer models. The computer models draw on about a hundred thousand million current weather observations, including data from 30 to 40 complementary satellite instruments, to generate the information used by meteorologists to prepare weather forecasts." Colorado Scientists: Wildfires Make Their Own Weather. Here's another story that caught my eye from The Denver Post: "Researchers striving to understand the ways wildfires make some of their own weather are looking at clouds from both sides now. 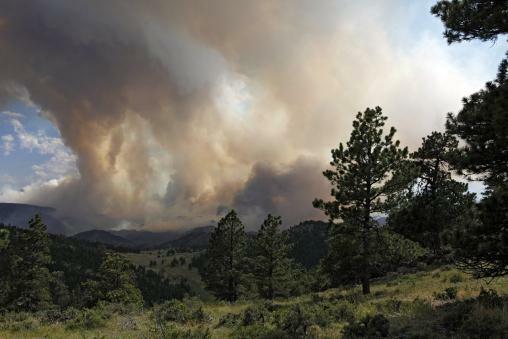 Colorado scientists work to predict ground conditions by learning how heat and smoke radiating from big fires like the more than 52,000-acre High Park fire can affect wind and cloud formation. With more accurate forecasts, fire managers could better predict fire behavior, deploy assets and protect firefighters, residents and property, said Sher Schranz, research coordinator with Colorado State University's Cooperative Institute for Research in the Atmosphere." Recent Droughts Don't Compare To Those Of The Past. The Dust Bowl of the mid-30s still sets the standard for extreme drought across the USA. Since then land management has improved, lowering the risk of massive dust storms somewhat. Here's an excerpt of a story from The Athens Banner-Herald The Water Environment Federation: "Georgia has gone bone-dry during a series of harsh droughts dating back to the 1980s -- but long periods of drought may just be normal for our part of the world, according to a new study. Historical rainfall measurements go back only a little more than a century. But scientists can study tree rings, which show how much trees grow year by year, and reconstruct how wet or dry it was during the tree's lifespan. When Neil Pederson and 11 other scientists analyzed tree-ring data from forests in the Apalachicola-Chattahoochee-Flint river basin dating back to the mid-1600s, they found extended dry periods considerably longer and often more intense than what we've seen lately, according to their article in the journal Environmental Research Letters." "I wish you could cover ALL of Minnesota instead of so much Twin Cities area. 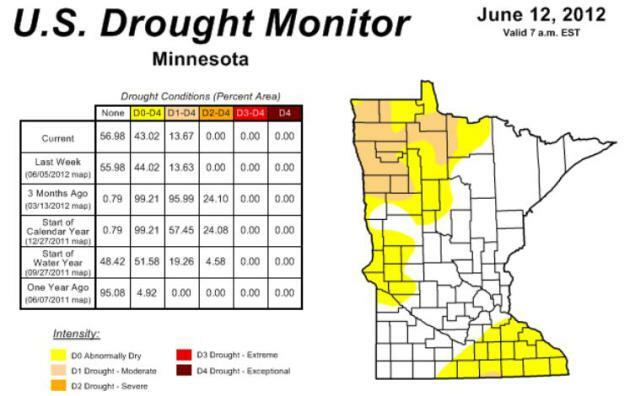 We in SE Minnesota are pretty much stuck in a drought, and you never talk about that. As I get the Star Tribune, it would be nice. Just to let you know, not ALL of Minnesota is basking in green grass and gardens! Beyond that, keep up the good work and send your rains here!" Mark - I'd encourage you to scroll through older Star Tribune weather blogs, going back weeks or even months. I think you'll find that I try to include data, stories, photos and links for the entire state. I'm sensitive to a perceived "Twin Cities bias". The reality: 85% of the population lives in or near the Twin Cities, so (of course) we tend to spend more time on weather for MSP. But that doesn't mean we ignore weather across greater Minnesota. I get it: all weather is local. If you live in St. Cloud or Rochester you may not care about what's happening 50-100 miles away. It would be logistically impossible for me to tailor the blog for every town in Minnesota - as it is I spend 4-6 hours/day fine-tuning the stories, photos, links and extras that go into the daily blog. It's a never-ending beast, but I try to pick stories, maps and URL's that might appear to the most readers on any given day. It's true, the metro is no longer in drought, so that may shade my thinking about what's important and timely. Your e-mail got me off the dime; I checked the latest U.S. Drought Monitor for an update on conditions statewide (latest information above). It shows "abnormally dry" conditions for the southeast, but - technically - no drought. Moderate drought conditions linger over the Red River Valley. Thanks for your note - I promise I'll try to keep a statewide perspective going forward. "Weather is always fun, I was just outside taking in a 5 minute break. 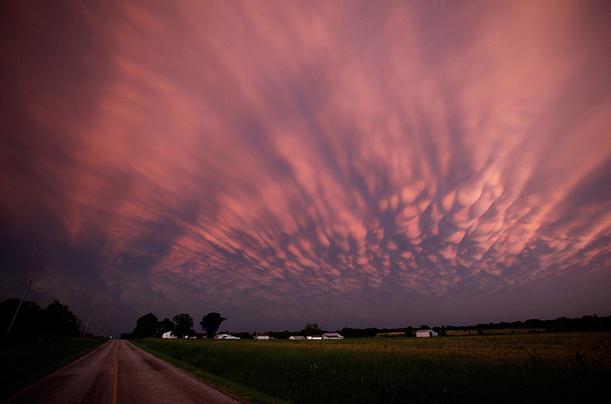 I was noticing the clouds moving east to west and lots of hot humid heat, I predict today will have some really good storms , it always seems that when they move in a more reverse action ( the clouds) we get more severe weather?" Chris - you're right. Although weather systems usually move from west to east, an east/southeast wind flow in the lowest few thousand feet of the atmosphere implies a storm to the west or southwest of your location. Most T-storms are preceded by a south/southeast surface wind and a rapidly falling barometer. 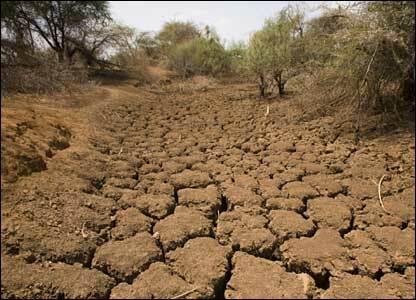 "You comment often about the global warming and its effects on temperature and rainfall. But what about the wind? It seems to me that there are many more windy days this year." Mary - the greater the swings in temperature, the faster winds have to blow to keep the atmosphere in equilibrium. With climate change we're seeing a northward shift in temperature gradients and subsequent wind speeds. Storms form along the boundaries between cool air and warm air. As North America warms that temperature gradient is shifting north. What further complicates matters is that the Arctic is warming roughly twice as fast as the Lower 48 States of the USA. We're in uncharted waters to some degree. 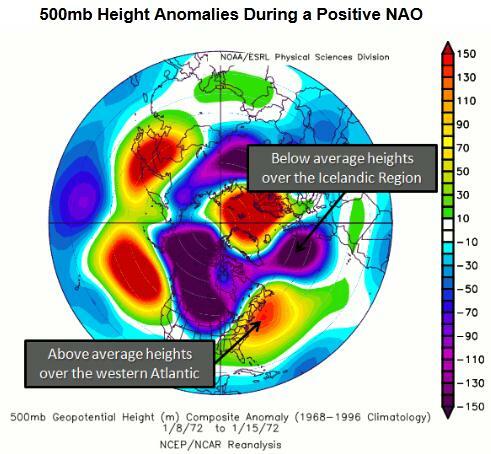 I asked a few climate scientists for their thoughts - one suggested a correlation between warming and (higher) wind speeds, another remarked that "shifts in storm tracks can be important but things like the NAO (North American Oscillation) are huge." The truth: the jury is still out. * map above courtesy of the State Climate Office of North Carolina. 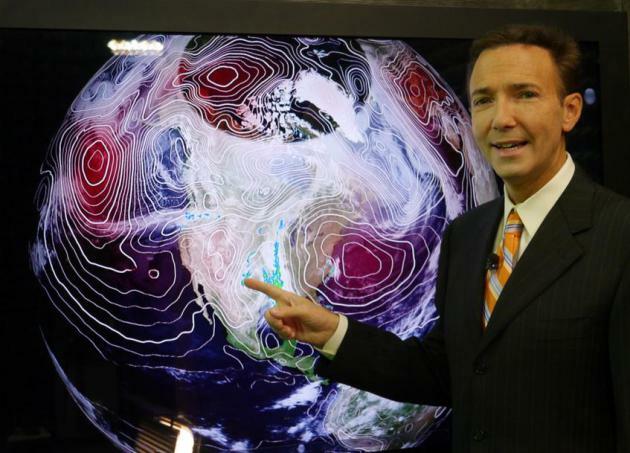 "Rock Stars" Of Kansas Weather: A Conversation With Four Local Broadcasters. The Wichita Eagle has the story at kansas.com; here's a clip: "Kansans have a well-known obsession for weather, which makes celebrities of the broadcasters who report it. There are few more recognizable people locally. They are equally important to their stations – for ratings and profits. In Wichita, that includes KWCH, Channel 12 chief meteorologist Merril Teller, who has been there for almost 31 years; KSN, Channel 3 chief meteorologist Dave Freeman, who has been there for 19 years; KAKE, Channel 10 managing meteorologist Jay Prater, who has been there nine years; and KFDI 101.3-FM news director Dan Dillon, who has been the voice of radio storm coverage for 33 years. It’s rare that the four are together, but they have much to discuss when they are." 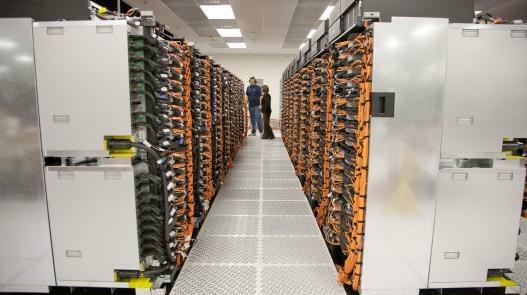 IBM's "Sequoia" Confirmed As World's Fastest Supercomputer. Here's an excerpt from a story at gizmag.com: "Clocking a performance of 16.32 petaflop/s, IBM's Blue Gene/Q-class supercomputer Sequoia has become the fastest supercomputer in the world according to the latest TOP500 rankings released today. Sequoia, owned by the Department of Energy and based at the Lawrence Livermore National Laboratory, has relegated Fujitsu's K to second place." 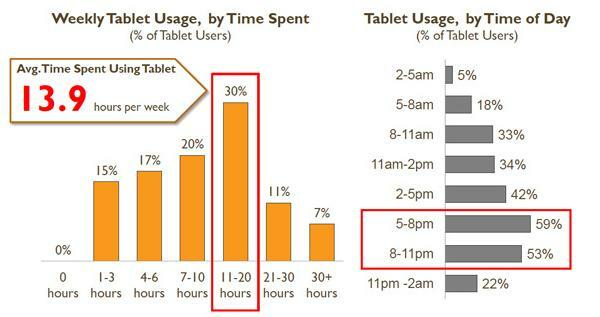 Tablet Adoption Explodes, Study Reveals Key Usage Patterns. Here's a study that confirms what you may already suspect - the iPad is dramatically changing how we use the Internet and consume media. An excerpt from lostremote.com: "A new tablet study by the Online Publishers Association reveals that tablet adoption continues to skyrocket, now up to 31% of respondents — and a surprising 74% use the device daily. The study (.pdf), conducted with Magid, drills down on usage patterns and other handy facts. It’s a great nuts-and-bolts study to have, and we’ve highlighted TV-oriented data points below." 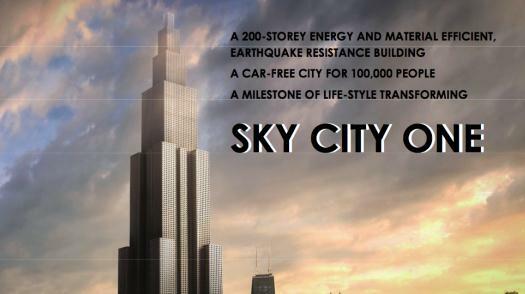 World's Tallest Building To Be Built In Only 90 Days. How is that even possible? Gizmag.com has the story, here's an excerpt: "Chinese construction company Broad Group has announced ambitious plans to construct the world's tallest skyscraper in an implausibly swift 90 days. If the target is met, the 838-meter (2,750-ft) "Sky City One" will take only a twentieth of the time that the Burj Khalifa, the world's current tallest building, took to construct, and will stand 10 meters (33 feet) taller still upon completion. The secret to the rapid construction is prefabrication. Approximately 95 percent of the building will have been put together in modular form before work even commences on site." Microsoft Introduces A Challenger To The iPad. Details from The New York Times (subscription may be required): "LOS ANGELES — In its most strategically significant push yet into the hardware business, Microsoft on Monday unveiled a tablet computer called Surface that is intended to challenge Apple’s iPad. At a press event here, the company showed off a tablet that is about the same weight and thickness as an iPad, with a 10.6-inch screen. The device has a built-in “kickstand” that allows it to be propped up for watching movies, and a thin detachable cover that will serve double duty as a keyboard. " 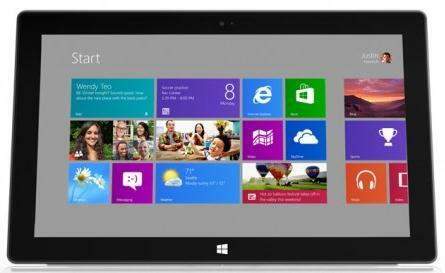 * gizmag.com has more on the upcoming Microsoft Surface tablet here. ** gizmodo.com is impressed, in their words "Microsoft Surface just made the Macbook Air and iPad look obsolete." 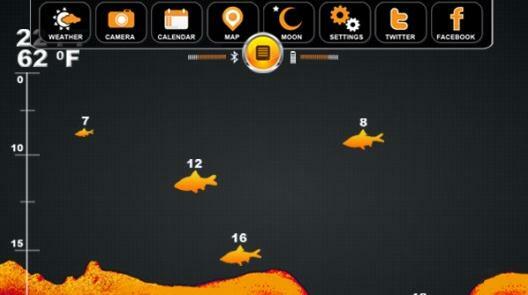 New Device/App Could Turn Your Smartphone Into A Fish Finder. This nugget caught my eye, courtesy of those wondrous techno-geeks over at gizmag.com: "Your smartphone and/or tablet can do just about everything else, why can’t they help you catch fish? Well, if the Deeper fishfinder ends up being commercially produced, they will be able to. The floating device would be paired with the user’s Android or iOS device, and would let them know if fish were in the area. To use Deeper, users would attach their fishing line to one of three attachment points, depending on what sort of fishing they were doing. Using their regular rod and reel, they would then cast the 6-cm (2.4-inch) diameter sphere out onto the surface of the water – fresh or salt – in which they planning to fish." Size Matters. At least when it comes to TV screens. 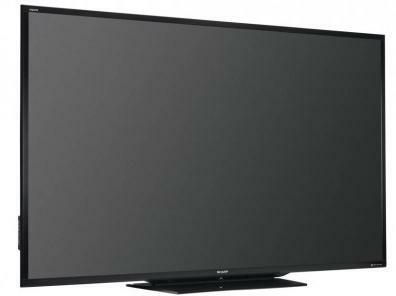 Sharp is launching a 90" LED TV that will only set you back 11k. What a bargain! Right. Christmas is coming. Then again, I'm not sure this baby would fit under the tree. Click here at your own peril. Sauna-Like. I should have been serving towels with yesterday's forecast: 93 in the Twin Cities, 92 at Redwood Falls, but only 81 at St. Cloud and a brisk 65 Grand Marais and International Falls (on the cool side of the front). Did you happen to catch the (wild) lightning display with the last few squall lines? Unless you were in a coma you were probably jolted out of bed too. The same severe storms that whipped up 83 mph gusts at Belle Plain and spiky, lemon-size hail at Lonsdale (check the blog) sparked a lightning display that looked like the opening credits for the Book of Revelation. There's a direct correlation between lightning frequency and the severity of a storm. Continuous lightning? Head for the basement. "We've found the threshold to be 25 strikes/minute" said Earth Network founder Bob Marshall. 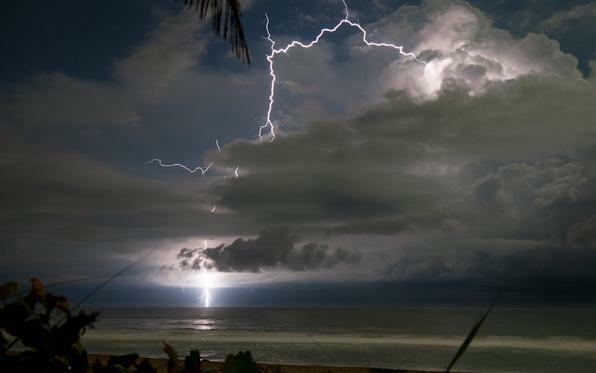 His company has deployed a global network of lightning sensors; in many cases severe lightning can tip off forecasters 15-20 minutes before a severe storm warning is issued. Impressive technology. Rain and storms linger today as Canadian air approaches; by Thursday dew points drop into the 50s, meaning nearly half as much water floating overhead than yesterday. Lately it seems like every other day we get whacked by severe storms - I'm happy to report a quiet spell Thursday & Friday. 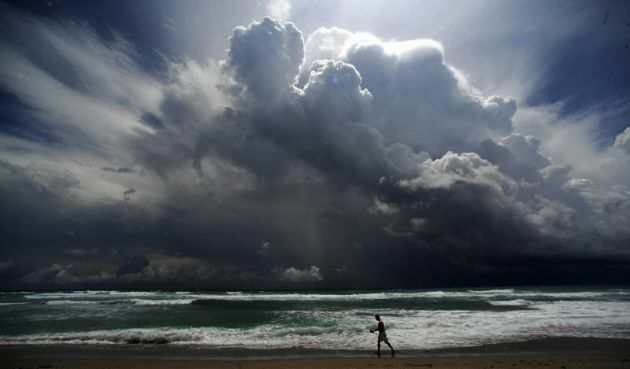 T-storms Saturday give way to Sunday sun. I'm praying for a lake-friendly weekend. By the way, summer officially arrives at 6:09 pm this evening. 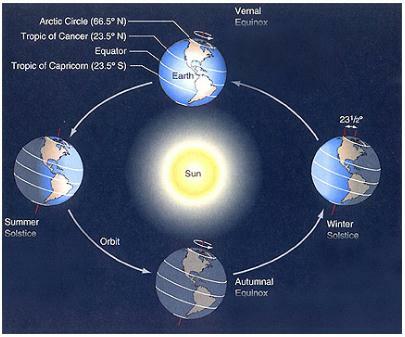 Welcome Summer Solstice! 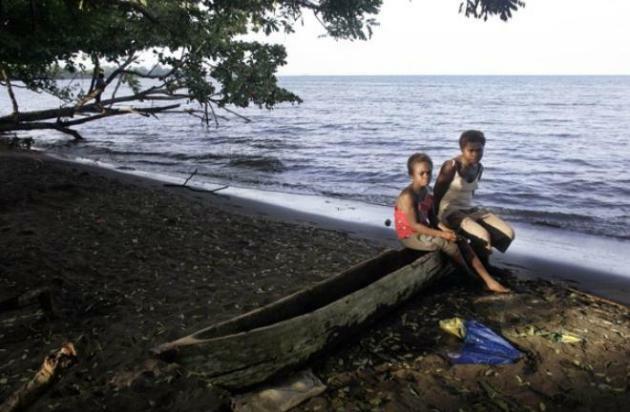 Yet Another Study Confirms Global Warming Is Human-Caused. Here's an excerpt from a story at Ars Technica: "Researchers averaged the results from a number of climate models, and compared that to global temperature records for the upper 700 meters of the ocean from 1960 to 1999. The temperature record is less complete for the deep ocean, and its massive volume and separation from the surface subdues its response to climatic changes. In addition to the global average, they also analyzed each of the major ocean basins (North and South Atlantic, North and South Pacific, North and South Indian) separately. They found that the anthropogenic “fingerprint” was apparent in the observed temperature record at the 99 percent confidence level. That means the observed warming is beyond the variability seen in model simulations where greenhouse gases are kept constant, but is exactly what the models predict for a world in which humans change the composition of the atmosphere." 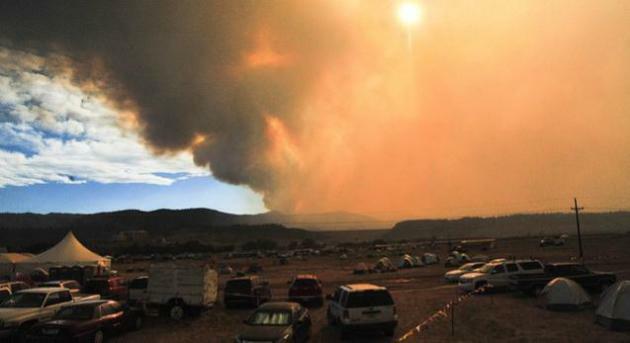 Is Climate Change To Blame For Massive Colorado Wildfire? It's not possible to directly connect the dots between any one specific storm, flood (or wildfire) and climate change. That preamble aside, a warming (and in some cases drying) climate now pervades our weather system, it flavors the day to day changes (and increasing extremes) we track on our weather maps. Here's an excerpt of an interesting (theoretical) story from revmodo.com: "For almost two weeks, the High Park wildfire in Northern Colorado has captured American hearts, minds and headlines. In the first few days, dry temperatures and beetle-killed trees allowed the fire to spread across thousands of acres almost instantly. Firefighters from Fort Collins, Colo., and beyond were brought in to help with the blaze, assisted by members of the Colorado National Guard who lent two UH-60 Black Hawk helicopters for water drops over the area. Although it was feared that extremely dry conditions and driving winds could feed the fire into the autumn months, local authorities are now reporting at least 50 percent containment. Now comes the truly ugly part, when damage must be assessed." 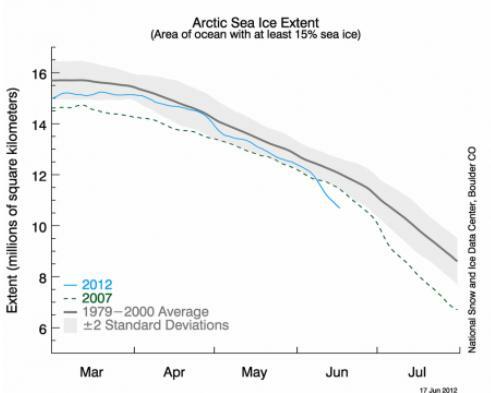 Global Warming: Arctic Sea Ice Extent Dips Toward New Lows. Here's an excerpt from a story at The Summit County Citizens Voice: "Arctic sea ice extent, which hovered near average in May, has declined rapidly in the past few weeks to dip well below average and below the level it was this time of year in 2007, when it reached a record low in September. “Basically, right now, we’re quite a ways below 2007, and neck and neck with 2010, which was the lowest for this time of year … we’re very near record low levels for this time of year,” said Dr. Walt Meier, a sea ice expert with the Boulder-based National Snow and Ice Data Center." Senator John Kerry Addresses Climate Change Inaction. Yesterday, Senator John Kerry, Chairman of the Foreign Relations Committee, delivered a major floor speech at the Rio+20 Conference urging U.S. action to combat the threat of global climate change. Here is an excerpt of his speech: "Thomas Paine actually described today's situation very well. As America fought for its independence, he said: "It is an affront to treat falsehood with complaisance." Yet when it comes to the challenge of climate change, the falsehood of today's naysayers is only matched by the complacency of our political system. It is well past time that we heed Thomas Paine's admonition and reaffirm the commitment made by the first President Bush. As a matter of conscience and common sense, we should be compelled to fight today's insidious conspiracy of silence on climate change - a silence that empowers misinformation and mythology to grow where science and truth should prevail. It is a conspiracy that has not just stalled, but demonized any constructive effort to put America in a position to lead the world on this issue, as President Bush promised we would and as Americans have a right to expect we will." 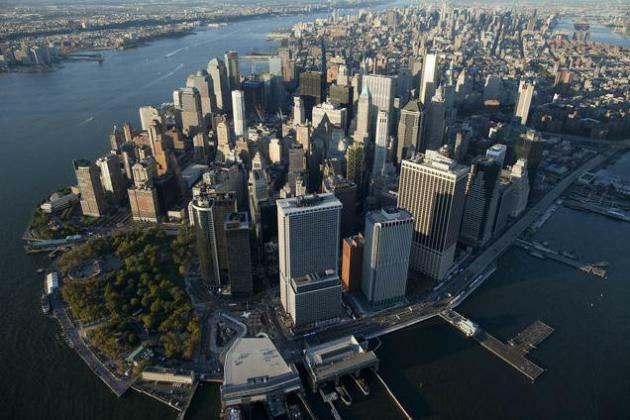 Cities Lead Effort To Curb Climate Change As Nations Lag. Bloomberg.com has the story; here's an excerpt: "New York Mayor Michael Bloomberg is leading an effort by 58 of the world’s largest cities to reduce greenhouse-gas emissions while federal governments struggle to meet global targets following two decades of discussions The member-cities of the C40 Cities Climate Leadership Group produce about 14 percent of the world’s greenhouse-gas emissions. Their actions to improve energy efficiency and invest in renewable power will reduce emissions by 248 million metric tons in 2020, Bloomberg said on a conference call. The cities can cut emissions by more than 1 billion tons by 2030, or the equivalent annual output from Mexico and Canada." Underground Carbon Dioxide Storage Likely Would Cause Earthquakes. The L.A. Times has the story; here's an excerpt: "The notion of mitigating harmful carbon dioxide emissions by storing the gas underground is not practical because the process is likely to cause earthquakes that would release the gas anyway, according to a commentary published Monday in Proceedings of the National Academy of Sciences. 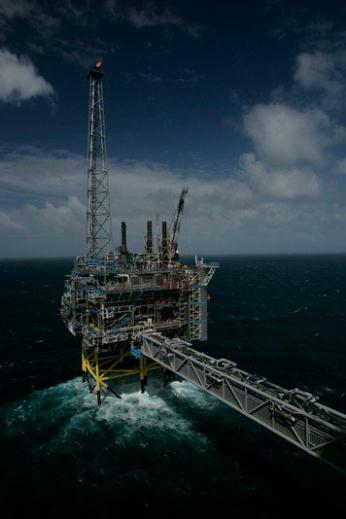 While the scientists do not expect that the approach would cause any large and dangerous seismic activity, they say it is likely that the earthquakes would be severe enough to jeopardize the ability to store the gas underground over the long term." Making The Impossible Possible: From Kennedy's Moonshot To Solar's SunShot. Here's an excerpt from an interesting (encouraging) story at Huffington Post: "In my two years as the director of the Energy Department's Solar Energy Technologies Program, I have often been accused of being an eternal optimist. I see our nation's energy challenges as an incredible opportunity -- one that has the potential to revolutionize our economy, environment, and national security. That's why, back in 2010, we established the SunShot Initiative to decrease the total installed price of solar energy by 75 percent by 2020. We took our inspiration from President Kennedy's 1962 "moon shot" speech that set the country on a path to regain the lead in the space race and land a man on the moon. Many thought a manned lunar mission was beyond NASA's capabilities, but this bold move ultimately united the country when it proved successful." Renewables No Fix For U.S. Military Fuel Woes. Here's a snippet of a story from Reuters: "Renewable fuels for U.S. military ships and jets are likely to remain "far more expensive" than petroleum products absent a technological breakthrough, a study for the U.S. Air Force found on Tuesday, questioning a Pentagon push for alternative energy. 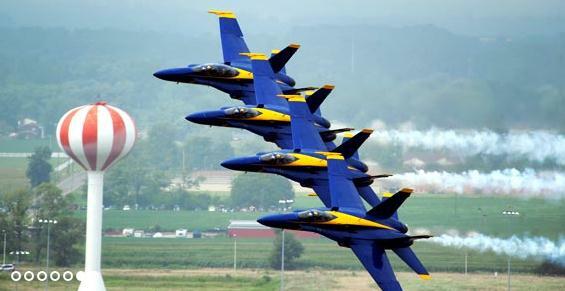 The study by the RAND Corporation think tank said that while the U.S. Defense Department is a huge consumer of fuel at about 340,000 barrels per day, that figure is a tiny fraction of the 87 million barrels per day of global demand, too small to influence price significantly."